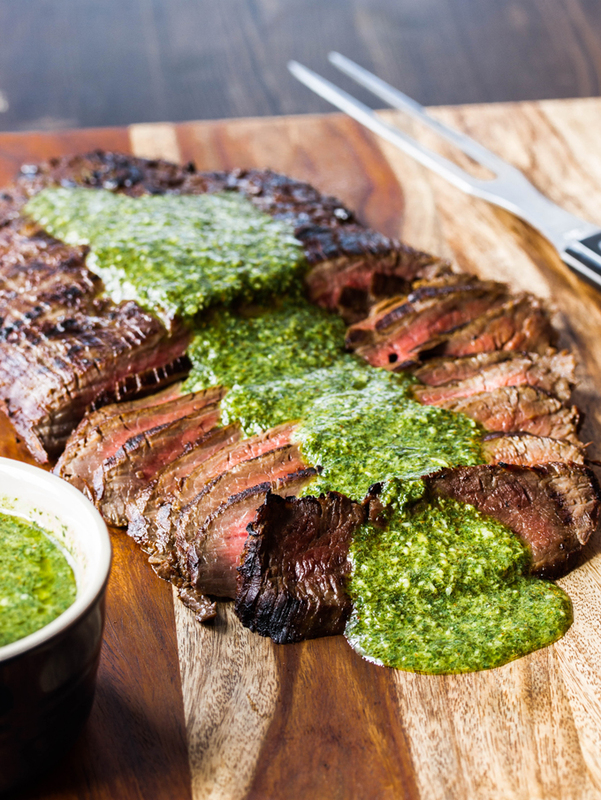 This grilled flank steak is amazingly tender and flavorful when marinated in a delicious sauce then grilled to med-rare, cut on the bias, and covered in fresh and fragrant chimichuri sauce. 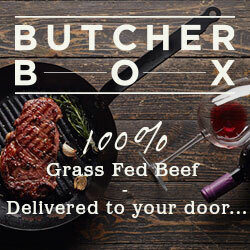 Great for feeding a crowd and for leftover steak sandwiches! 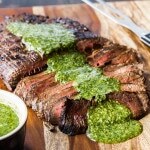 Today you get grilled flank steak instead of a cocktail. But if I was you, I would have it with some wine! 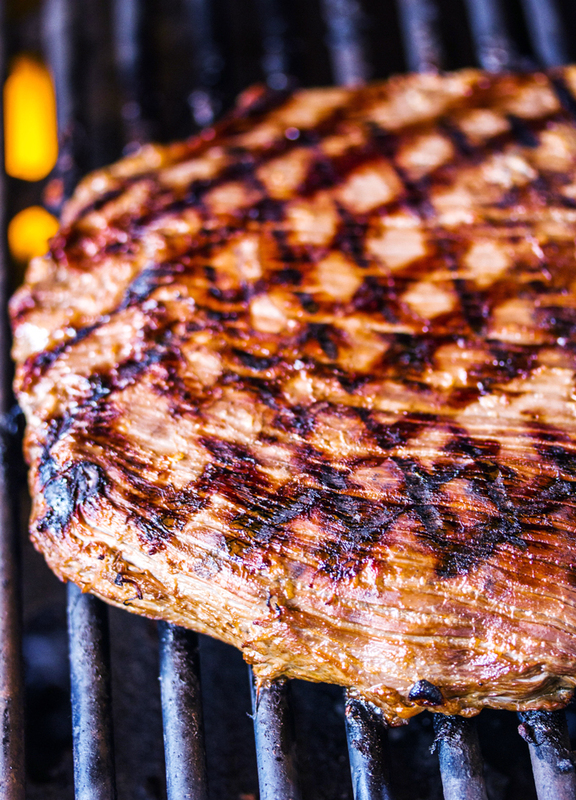 Grilled flank steak is often overlooked and cast aside for fillet minion or rib-eyes, and mind you, those cuts are great, but for those of you who have had a properly prepared marinated and grilled flank steak, you know it won’t be your last. Typically a tougher cut of beef, if its marinated and cooked to medium rare and then cut on the bias (against the grain), it becomes so flavorful, tender and versatile. I happen to think that flank steak is pretty cheap as steaks go, but Debbie tells me that it used to be half the price! Which would be even better, but I buy my flank steak at about $13 dollars Canadian and that will feed 4 people pretty easily. Unless they are all men, in which case you might need another. That’s still pretty cheap considering a decent steak can cost around $10 a steak. I was slightly skeptical about mixing the teriyaki marinade with the chimichuri sauce. Asian flavors mixed with those of South American. But its Debbie’s recipe so we did it her way… and it turned out amazing. Lets just call it a flavor fusion, yes? Besides, you don’t really taste the teriyaki. It really just tenderizes the meat and makes the beef more flavorful. The chimichuri overpowers any teriyaki flavor anyways, but in the best way possible! The chimichuri recipe is so fresh and fragrant with all the green herbs, garlic, and lime juice that I could just sit and eat it with a spoon. When we make grilled flank steak, even though one will usually feed our family, we often make two just so we have left overs. This is one steak that still tastes great the next day! make these cheesesteak stuffed portabellos with your leftovers! 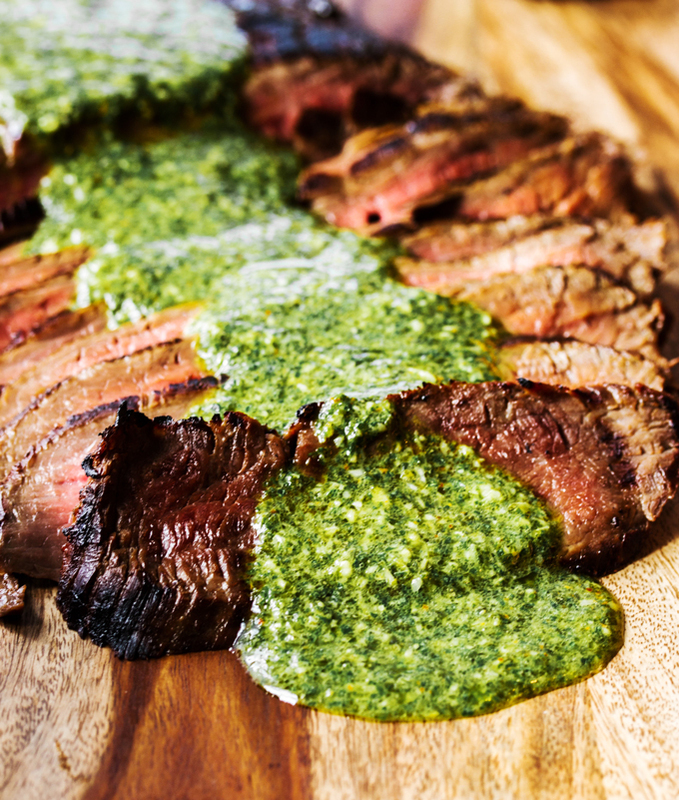 This grilled flank steak is amazingly tender and flavorful when marinated in a delicious teriyaki sauce, grilled to med-rare, cut on the bias, and covered in fresh and fragrant chimichuri sauce. Great for feeding a crowd on a budget and for leftover steak sandwiches! Place everything in a container with a lid or ziplock bag and marinate the flank steak at least 4-5 hour or overnight is best. Fill a blender or food processor with the cilantro and parsley. Then add the lime juice, garlic, cumin and cayenne, and salt. While the blender is on, add the olive oil slowly. Blend until it is well pureed and somewhat smooth. Heat your barbecue to medium-high heat. Wait for it to get nice and hot. So you can't hold your hand over the grill for more than a second. Take the steak off the grill and tent (cover) it with foil for 10 mins to let it rest and the juices redistribute. With a sharp knife, slice the steak in thin slices against the grain. Serve with more chimichuri sauce on the side. Enjoy! If your flank steak is less than 1 1/2 inches thick, reduce the cooking time slightly. Don't close the lid while the steak is cooking. Wow that beautiful vibrant green, and those grill marks, absolute perfection! I love having a jar of chimmichurri in the fridge at all times. Hi Chantelle! Thanks for the comment 🙂 I agree, chimichuri is sure worth keeping on hand! This recipe looks great! In your intro you mentioned marinating this in teriyaki but the recipe list calls for soy sauce.. which would you recommend? Can’t wait to make this tomorrow! Sorry for any confusion, but to make teriyaki sauce (from scratch) you use the ingredients listed in our recipe. Including soy sauce. I have updated the recipe so that hopefully it is a little more clear. I have also updated the post to show links to some recipes we often use when we have left overs of this steak. If you have any left, you should definitely check out the steak sandwiches! This looks divine! What else would you serve alongside for a complete meal? Can’t wait to try! Hi Meredith, I would probably serve this with roasted or mashed potatoes. I love steak and potatoes 🙂 and that chimichuri sauce would be so good over roasted potatoes too! I would also maybe do corn on the cob and a green salad or some sauteed peppers, carrots and onions. Or even just a wack of steamed veggies. Hope that helps! Thanks for the excellent ideas! I made this in September for my boyfriend’s family, and it was such a huge hit! I made roasted potatoes for the side????. Since then I have also made a creamy goat cheese polenta and let me tell you, steak with chimichurri, roasted tomatoes & cheesy polenta is a surreal experience!